Orange County, just south of Los Angeles, is famous for its theme parks and classic California coastal communities like Newport Beach and Laguna Beach. But Orange County has also witnessed numerous victories for open space preservation and restoration, like the Bolsa Chica wetlands. These productive, tidal wetlands were cut off from the Pacific Ocean in 1900 by a hunting club. Throughout the 20th Century, cattle grazing, military installations, oil facilities and other inappropriate uses took their toll. In 1973, the State of California protected a portion of the original wetlands but the remainder was slated to become a commercial-residential marina. Conservation organizations went to court and succeeded in reducing the scale of the original development proposal. Then the State bought additional land, increasing public ownership to 1,200 acres. Wetland restoration culminated in 2006, when the connection to the Pacific was reestablished and salt water once again flowed in and out. Today, Bolsa Chica has regained its status as a critical stop for migratory birds on the Pacific Flyway and has become a popular destination for birders and school field trips as well. But Bolsa Chica is just one of Orange County’s many open space success stories. The Bolsa Chica wetlands were not only preserved but also restored after a century of inappropriate uses and damaging alterations. Orange County manages 15 regional parks and six wilderness parks with an impressive total of more than 30,000 acres. The largest of these is 8,000-acre Caspers Wilderness Park. Laguna Coast Wilderness Park, 6,500 acres in size, protects many of the last remnants of Southern California’s coastal canyons and safeguards important examples of disappearing ecosystems. In addition to regional and wilderness parks, Orange County maintains four beaches and the Upper Newport Bay Nature Preserve and Ecological Reserve. In 1996, the Central/Coastal Orange County Natural Community Conservation Plan was adopted to protect 39 sensitive plant and animal species including the Coastal California gnatcatcher and the coastal cactus wren. The Plan established a 37,380-acre reserve managed by the Nature Reserve of Orange County. The coastal portion of the Reserve incorporates ten components including the Laguna Coast Wilderness Park, the City of Irvine Open Space Preserve, Crystal Cove State Park and UC Irvine Open Space Preserve. The central portion combines eight additional components including Coal Canyon Ecological Reserve, Irvine Regional Park and Santiago Oaks Regional Park. 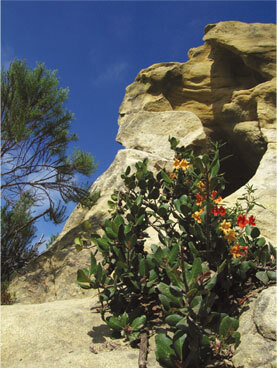 The South Coast Wilderness Area coordinates several individual holdings including the Laguna Coast Wilderness Park as well as Crystal Cove State Park, the City of Irvine Open Space and the Irvine Ranch Wildlands and Parks. Crystal Cove, which was born in the 1920s as a tiny coastal community, was placed on the National Register of Historic Places in 1979. The State of California is currently restoring the Crystal Cove historic district and has surrounded it with a 2,400-acre state park that features 18 miles of trails through coastal hillsides and opportunities to explore tide pools and beaches along 3.2 miles of shoreline. A 1,140-acre underwater park lies offshore for snorkelers and scuba divers. The waters of Crystal Cove are also one of several sites where the Kelp Restoration Project is repairing the kelp forest that provides critical habitat for many threatened aquatic species. The Irvine Company, which originally owned the vast Irvine Ranch and developed the City of Irvine, created a 50,000-acre open space system now known as Irvine Ranch Wildlands and Parks. In 2005, the Irvine Ranch Conservancy was established to work with multiple agencies to develop these lands into a model of conservation and passive outdoor recreation. Of the 50,000 acres in the Irvine Ranch Wildlands, 37,000 acres were designated by the U.S. Secretary of the Interior as a National Natural Landmark in 2006. In addition to Crystal Cove State Park and the Bolsa Chica Ecological Reserve, the State of California maintains Chino Hills State Park and six state beaches in Orange County. Likewise, the federal government contributes substantial open space with the Cleveland National Forest and the Seal Beach National Wildlife Refuge. Through cooperation between multiple governmental agencies, private landowners and dedicated environmentalists, Orange County has succeeded in protecting a wide assortment of natural communities despite its highly desirable location for development. As shown by the Bolsa Chica wetlands and other restoration projects, Orange County is also demonstrating its commitment to healing as well as saving its natural heritage.